Following Benj Lance, who made a special guest appearance as my crew, after climbing to the top of Alabama (Mt. Cheaha). For me, this race began about 23 months ago, when I was released from the hospital after a suffering from multiple deep vein thrombosis (DVTs) and bilateral pulmonary emboli (PEs) due to a traumatic ankle injury. A month later, I underwent surgery to temporarily insert an Inferior Vena Cava (IVC) filter to prevent new blood clots from forming while undergoing reconstructive ankle surgery. Serious running was out of the question for almost a year, but I started my rehab and recovery almost immediately. 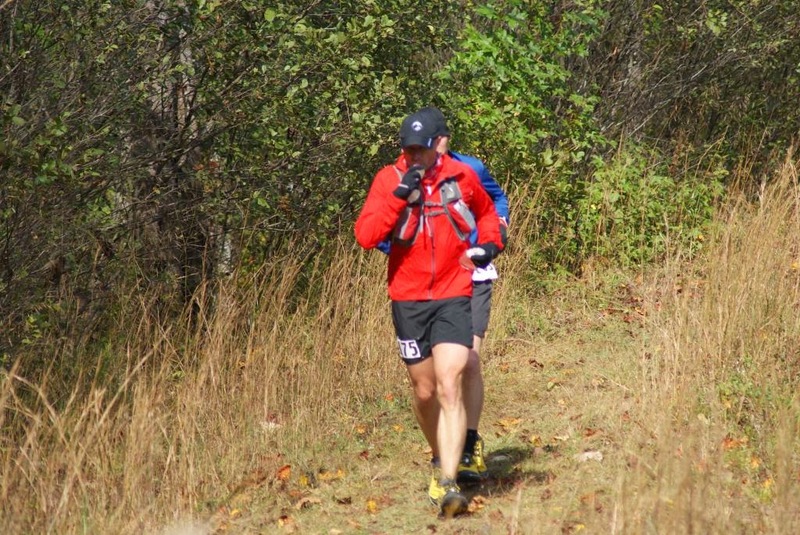 Fast forward to about 9 months ago, I had just finished the Mountain Mist 50K with an agonizingly slow finishing time. My training mileage was extremely low and I was still dealing with the fear of reinjury as well as mileage that was far lower than necessary to be adequately prepared for a challenging trail 50K. However, I was lucky enough to have a couple of friends who were more than willing to trudge along with me for as long as it took to cross the finish line (Thanks again to the Trice brothers:-). After the race, I decided I was ready to start training for ultras again in earnest. However, if I was going to put in all that time and effort again after getting a second chance at this running ultras thing, then I wanted to make it count. In other words, I wanted to see if changes in my diet as well as in my training would get allow me to actually become "competitive" in ultras. Obviously, being competitive is a relative term. I would measure my training success or lack thereof by comparing my own racing results, new vs. old. 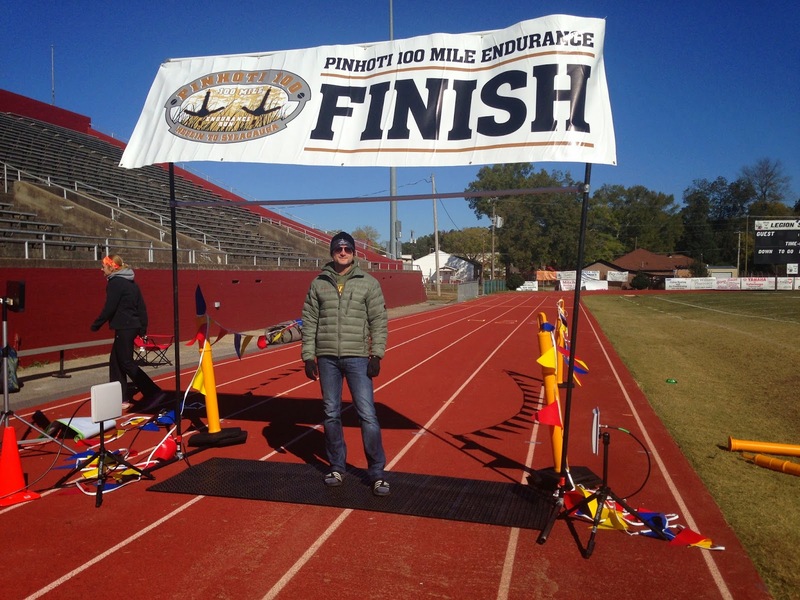 I also needed a goal and what better goal than the Pinhoti 100 Endurance Run, a race that I attempted twice before, once as my first attempt at a 100 miler, than again as my final attempt at the distance just weeks before my health troubles began. Yes, I finished four 100s in between, but the Pinhoti 100 buckle continued to elude me. That was not going to happen again. 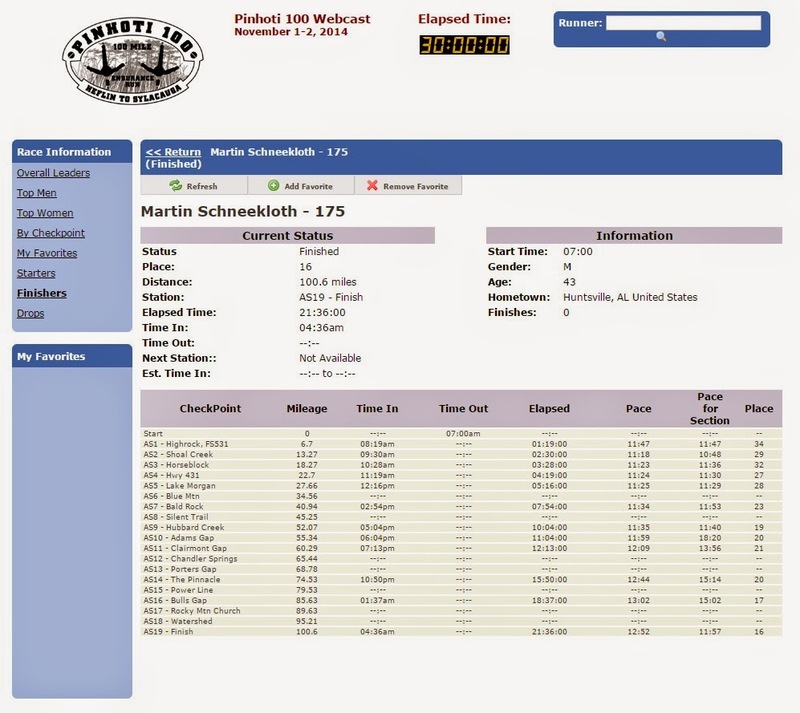 The 2014 Pinhoti 100 would be my official return to ultra marathons and I would claim that buckle this time, no doubt about it! First, I cleaned up my diet. I had had my cholersterol checked just before my health issues had started almost 2 years ago and my family doc suggested meds to lower my HDL levels. I firmly declined. I was determined to clean up my diet first to see if that would reap any benefits on that front. Of course, I forgot all about that during my year of physical rehab, so instead, I gained 20lbs. Cleaning up my diet now should not only help lower my cholesterol, but also help shed a few unwanted pounds. Just a month before Mountain Mist, my weight maxed out a 184lbs and a body fat percentage of 19%. I was determined to change that. No more sodas, fried food, fast food, bread made from processed flower, candy, or any other sources of empty carbs and unhealthy fats. Instead, I added lots of water (sparkling water preferred:-), Ezekiel bread, healthy fats from walnuts and almonds, blueberries, bananas, strawberries, spinach and grilled or baked chicken and fish. Did I religiously stick to that diet? More or less. I would (and continue to) allow myself to indulge here and there, but the aforementioned food items were no longer part of my regular diet like before. 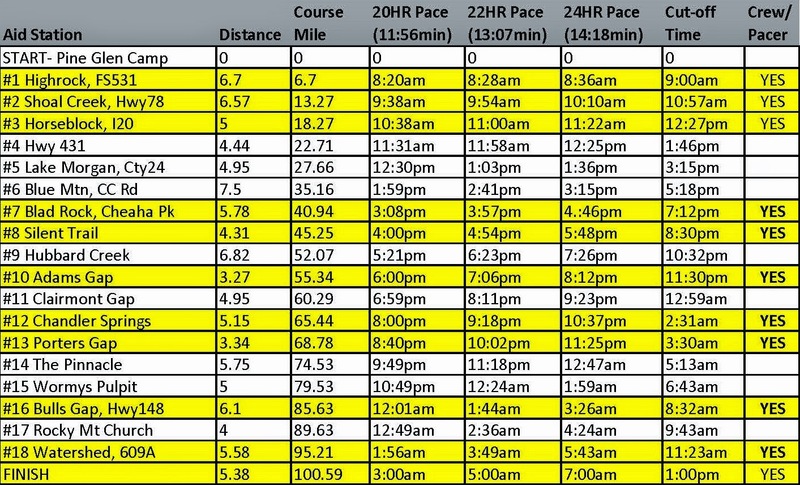 I slowly started to ramp up my mileage and I created a race schedule with lots of shorter stuff initially along with one ultra event per month to measure progress and to help me get my long runs in. Later on, I would add back to back races on my weekend schedule to relearn again how to run on tired legs. I had decided on a baseline mileage of 50 miles per week. A nine moth training cycle was rather long, but I wanted to be ready and comfortable at the Pinhoti starting line and even more importantly, I wanted to stay injury free. After my initial mileage ramp up, I followed a 4 week on 1 week off training cycle (e.g. 70/75/80/85/50), which I was able to stick to for the most part. As I continued to follow a healthier diet, the pounds came off quickly and as I added cross training to my regular training schedule (Pilates, Muscleworks and weight training), I replaced lost body fat with muscle. My I reached what I considered a manageable weight and body fat percentage 4 months into my new training/diet routine, 159lbs and 6% body fat, and I felt better than ever. Basically no muscle soreness after training runs or even some of the back to back training races. I guess the natural anti-inflammatories were doing their job. As I continued my training, my times improved. In my first 5K race of the year, I set a 30 second PR. I continued to set PRs at every single race after and over every distance I ran. I also collected my very first ultra marathon and road marathon wins during my training along with a couple of masters wins. To date, that streak of setting PRs still continues and I am well aware that it won't continue indefinitely, but while it lasts, I am going to enjoy it:-) It has been a great year so far. I had been looking forward to this race for nearly 9 months, so it wasn't surprising that my mind was preoccupied with this race all week. I had started to pile up race gear and supplies as early as Monday night. Thankfully, I didn't have to worry about drop bags, because I was extremely fortunate to have been able to secure a fantastic group of peeps to serve as crew and pacers for my goal race of the year. Cary Long aka Hot Wing Runner would be my crew chief and pacer and "gingerly cruising" Scott Bell and Jeff "GT-R" Deaton would be pacers as well as help out crewing. I was one lucky dude! Regardless, as race day approached, I was starting to doubt my abilities to execute my race as planned. Yes, my training had gone perfectly, yes, I had put in the miles, but 100 miles is 100 miles, so my training don't mean $h!t. Well, that's what went through my head anyway. Leave it to your family and friends to step up and be there for you when you need it most, even though I didn't really let on my self doubts. I was flooded with very personal messages of support from many friends and family as well as open words of encouragement through the interwebs aka Facebook and Twitter. Love it or hate it, but social media does have its benefits. In my case, I really enjoyed all the words of encouragement that were coming at me. I appreciated this more than anything and it allowed me to relax and truly look forward to the experience. 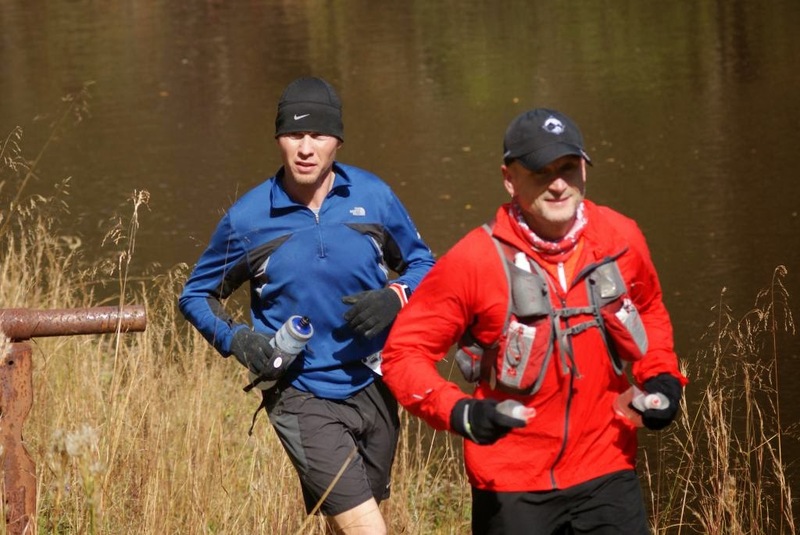 After all, this was my third attempt at the Pinhoti 100 and I had no plans to run more than 225 miles to earn my first Pinhoti 100 buckle, meaning this was the year I'd finish it, DNF was not an option. Friday arrived and I was pumped. I had gotten plenty of sleep the night before (which is a very important lesson I've learned as I never seem to get enough sleep the night before the actual race) and I only had a few items left to pack before Cary would pick me up around noon for a pre-race lunch and a short two and a half hour trip down to Sylacauga, Alabama for the packet pickup, pre-race briefing and dinner. I was done packing with a couple of hours to spare, so when I sat down to relax for a minute, I started to reflect on the past 2 years and how I got here. Of all the times I expected to become emotional on race weekend (e.g. finish line, seeing my wife at an aid station, etc. ), this was definitely not the moment, but here I was summing up the last 2 years and how my family and friends had been there for me in the most challenging moments. Yes, I got choked up big time and there might have been a couple of tears, but there were no witnesses, so I will deny it if anyone ever asks. I was ready to line up at the starting line and run this race. On cue, Cary pulled into my driveway and within minutes we were loaded up and ready to go. We had plenty of time to make it to the pre-race briefing, so we decided to stop at a BBQ place for lunch. Yep, that's what happens when Cary is your crew chief. He selected every piece of food known to man to cause gastrointestinal distress, I stuck to grilled chicken, fries and a salad. Just before we stopped for lunch, we discussed our running gear for the race. In that moment I realized that I had actually managed to leave my second most important piece of gear at home. Both of my UD vests with their bottles were still hanging in the wardrobe at my house. Thankfully, my training partners Jerry Abbott (Pinhoti runner) and James Duncan (his crew chief) were a couple of hours behind us, so a quick call and a desperate plea ensured that they picked up my vests and bottles at my house before heading down south. Now I was ready to enjoy lunch and try to relax. Cary and I arrived in Sylacauga 30 minutes before packet pickup started, but we weren't the first to arrive. There were already plenty of cars in the lot and other runners and crew buzzing about. Todd, Jamie and their crew of volunteers were putting the final touches on the pre-race event before a bunch of ultra runners descended upon them for race bibs and a bunch of race swag. There was plenty of time for me to catch up with a bunch of folks I had not seen in a few weeks and sometimes months. We enjoyed the pasta dinner before Todd proceeded to talk about the race course and the event that was to take place the next day. I had prepared zip lock bags for my crew for them to ready my running vest at each aid station. In fact, I had numbered them according to aid stations, so they would always know what I needed in my pack at any given time of the race. I had estimated different time goals and paces for the race, so they could manage their time accordingly, e.g. estimate times to meet up with me based on my current pace. Everything was ready, so I was able to just listen to Todd's briefing without too much worry. After the briefing, Todd finally started the fun part of the evening, raffling off free gear and other prizes. In years past, I had walked away with nothing, but this year was different. It started as it always had, Todd went through what seemed like hundreds of names and mine wasn't one of them. When we noticed that all prizes had disappeared from the table, we started to walk out. As we were leaving, Todd (sounding rather muffled on that microphone of his) mentioned something about "free entry" and "next year" and "Pinhoti" and I was like, hold off guys, there's one more prize. And as I am turning around, my name pops up on the screen. SCORE!!! No matter how tomorrow turned out, I was going to be back again next year. An hour later, we arrived at our motel in Heflin, AL with plenty of time for last minute race prep and some chit-chatter. We actually went through a nasty storm and I was starting to think that maybe the race wasn't going to be dry after all. Cary, Jerry, James and I all stayed at the same motel while Scott and Jeff would join us on course the next day. It was the cheapest place available and extremely close to the race start, so I was pretty pleased with my booking. That was, until we actually started to try to go to sleep. Initially, Cary and I though that the room next door was pretty noisy and those were probably fellow ultra-runners celebrating the day to come. While Cary was still wondering if maybe those folks were ultra runners a few hours later, I was convinced pretty early on that that was not the case. We turned in for the night around 9:30PM and at 10PM sharp, the night and any chance of getting any sleep pretty much ended for Cary and I. But why, you wonder? Well, Cary and I were hearing strange sounds from next door for about an hour straight. Nope, these were not muffled noises, these were all out screams of intense joy or intense pain. That's about as PC as I can describe it. This intense joy (or was it pain and agony?) was expressed verbally and in very specific terms. Anyway, while we were giggling about it for about 5 minutes, an hour later we both were over it. Cary being the ever concerned and caring person that he is, proceeded to call the front desk: "Yes ma'am, I think that someone in the room next door might be hurt. Yes, it sounds like someone might be in serious pain, a woman's been screaming pretty badly." I though he pretended to call until 3 seconds later the phone next door rings and after a short conversation, the woman must have started to feel better, because the screaming stopped and a TV was turned on instead. Phew, dodged that one, or so we thought. An hour later, the entire episode repeated itself and then again and again...all night long, all the way through our 5AM wake-up call. This stuff only happens when you travel with Cary. Note to self, ear plugs aren't just for airplanes anymore. At this moment I was glad I made sure to have had a good night's sleep the night before. After my pre-race morning ritual Cary and I headed out the door. We met up with James and Jerry at the Hardee's next door, so our crew could fuel up for the long day ahead. Jerry and I had opted for healthier food choices. After a pretty short drive, we arrived at the race start with 45 minutes to spare, but the place was already jammed with other crew and runner's cars and trucks. It was still pitch black outside, but we knew that daylight would be here just in time for the actual start. We walked the half mile or so to the actual race start and got signed in. After all, nobody wants to run 100 miles only to be told they weren't official, right? We all took care of our last minute needs before meeting up with Paul Morris, another one of my training buddies for a quick pre-race group picture. I had been debating all morning whether I needed to wear long pants, but as 7AM approached, I was glad I opted for the shorts. After all, this was a race and I would warm up eventually if I just ran hard enough:-) It didn't hurt that the weather was actually somewhat kinder to us than initially predicted. I was ready to go! As we were lining up at the start, I wanted to make sure I wasn't too far back, because I wanted to avoid the conga line that was going to form pretty much right after the start of the race. While I didn't avoid it entirely, I did end up in one that was moving at a pace appropriate for me this early in the game. It prevented me from getting sucked into a fast early pace. I pretty much lost sight of all my buddies right from the start, but I did end up just behind Suman aka Marathon Runs after passing a couple of folks. He and I had met on the hottest day of the year in a race that went much better for him than it did for me (e.g. unless you call walking 10 miles with severe quad and calf cramps a good day). We stayed in touch after that comparing training notes, etc. for Pinhoti. We both had similar plans this morning, try to run a 11-11:30 min per mile pace until the halfway point around mile 50 and see how you feel. We stuck to that script pretty much from the start. Suman was leading the way and I was following along. It stayed this way pretty much for the first 20-25 miles, when I decided to pass him on a descent in an effort to charge ahead to take a quick pee break on the side of the trail. That was the last time I saw him, but I am glad to report that he finished the race. After I "charged" ahead, another runner I had met during these early miles, a guy from Russelville, AL, stayed with me as he had similar plans for his first 100 mile attempt (Sorry I forgot your name, buddy, but I did enjoy the miles we ran together. Hit me up on FB, so we can reconnect.) We actually ended up running together for 40 miles all the way to the top of Mt. Cheaha, at which point I lost sight of him. We continued to run together chatting about previous races and our plans for the day. We were both feeling great and good company made the first few miles of the day go by extremely quickly. Cary met me at every aid station possible, ready to refuel me and tend to me needs. He made it possible that I went through aid stations faster than I ever had before. In fact, I did not even see the aid station tables until after mile 40. I had set out four goals, A, B, C and D, for sub 20, sub 22, sub 24 and sub 30 hour finishes, respectively, and my pacing charts were accounting for all of these to allow my crew to adjust accordingly. ...ready to refuel after covering the first marathon distance. When I completed my first climb of the day to the top of Mt Cheaha at Bald Rock, I was still on target, but what was even more exciting at that point of the race was the many familiar faces I saw here. James had ventured about a mile down the trail to meet me and Jerry, who was just behind me. As I got to the top, there was Benj Lance with his usual huge smile. He was another local runner, who had decided to pace someone at Pinhoti on short notice. As a result, I got to see another local running buddy unexpectedly. As I trotted down the boardwalk, I saw another local runner Megan Nobriga, who was here to crew as well as Brad Goodridge and Philip Sustar, two Georgia guys and exceptional ultra runners whose friendship I value and whom I respect very much. By this time, Cary had also met up with the rest of my crew, Scott Bell and Jeff Deaton, who had made their way from Nashville to help me out (By the way, I can't wait to repay this huge favor, guys!). I had the biggest smile on my face. Seeing all of these folks really made my day and I felt like I hadn't even started running. I was pumped. I headed down towards "Blue Hell" with not a care in the world. Me smiling big with my crew chief "extraordinaire" Cary Long. Blue Hell is about one thing and one thing only, don't break your neck. Forget about your pace, just make it down in one piece. I did. I started running again as soon as I reached the bottom and I knew I only had 3 more miles until I would pick up my first pacer, Scott. During my first attempt at Pinhoti four years ago, I was feeling tired at this point, my knees had started hurting and by the time I reached the jeep road, I was ready to quit, which I eventually did at mile 60. I arrived at Silent Trail aid station at a faster than expected pace. I tried to push a little during the short road and jeep road section just because it felt good. Scott was ready to go and off we went. 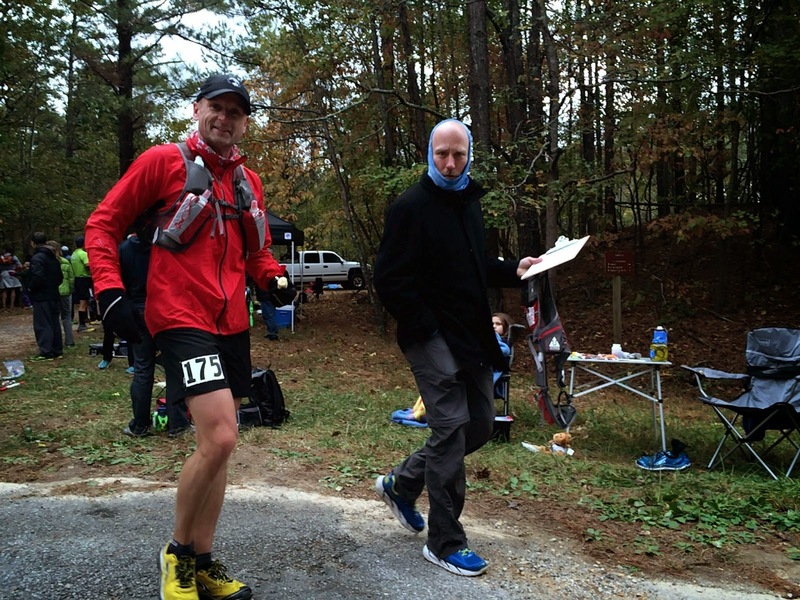 Arriving at Chandler Springs aid station at mile 65 with my awesome pacer Scott Bell! My fueling strategy had been working perfectly and I only recall one time were I really didn't feel like eating, but that phase passed as quickly as it had arrived. Chatting with Scott kept my mind occupied. We knew we wouldn't see my crew for about two hours until we reached Adam's Gap at mile 55. In between we hit the Hubbard Creek aid station at mile 52. I felt like I was still moving well. My crew made a point of not discussing my race goals with me or the fact that I might no longer be on track towards my A goal. Reality was, I realized pretty soon after Cheaha that I would not be able to maintain my current pace across two more mountains, which is what I would have had to do. I knew running up Pinnacle was not a realistic option, which is what would have been required to hit my A goal...and I was okay with it. My race was really going well regardless, I was out here with a bunch of my friends who'd given up their weekend's with their families to help me achieve my main goal, which was to finish this thing and I knew I was going to finish it. I decided to keep pushing, after all, I had three more goals to strive for:-) I think I went silent once while running with Scott. I remember realizing that I hadn't said a word in a while and Scott confirming it by asking me if I was okay. I wouldn't really fall it a low point, because I wasn't really considering quitting at any time during this race, it was just a quiet moment. I'm sure Scott enjoyed the fact that I'd shut up for a few minutes anyway. When we finally met up with my crew again at Adam's Gap, I was glad to see them. Every aid station signified one step closer to the finish line and that's how I run 100 miles, just one aid station at a time, never thinking further ahead. Adam's Gap signifies the halfway point of this race for many folks just based on the course profile. Even though I had no foot issues at this point (we were able to cross every creek keeping our feet dry), I followed Scott's advice and switched from my Altra Lone Peak 2.0s to my Altra Olympus. I also went ahead and changed socks (Injinjis with wool) and my top layers, hat and gloves. As soon as I started walking, these shows felt tighter than the Lone Peaks had and it worried me a little bit. I was afraid that my toes touching the front of the toebox already would spell disaster on the upcoming downhill sections during the remainder of the race. Thankfully, these concerns were unfounded. I did not have a single blister during this entire adventure, thanks Injinji and Altra. I'm pretty sure we had to start using headlamps starting around mile 55 as well. 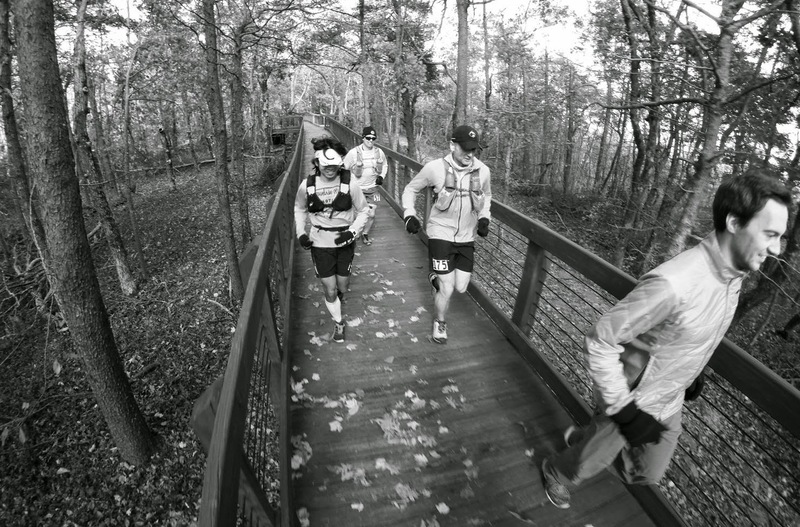 Again, we would not see our crew for a couple of hours as they would not be able to meet us at Clairmont Gap (mile 60). I kept eating a couple of boiled potatoes and half a banana every time we came through an aid station in addition to a swig of EFS and a Honey Stinger gel every hour. I would also try to consume 14-20oz. of fluids between aid stations, alternating between Skratch and Hyper Skratch for electrolytes and extra sodium. I took SCaps by feel throughout the day as well to stay on top of my salt intake. It was cold, but you still sweat and cramps wasn't anything I wanted to deal with today. This plan worked out great as I never felt hungry or bloated or deal with any stomach or even leg issues. I was also able to intermittently step off the trails, jut enough to know that I was still hydrating well. Jeff was ready to tackle the next 20 miles with me and he was finally able to tell me about his first 100 mile finish a few weeks earlier. He had had an amazing race experience running with some serious legends in the sport of ultra running and I was only too happy to have him tell me about it. It made the next few miles and the climb up Pinnacle much easier. In fact, the climb up Pinnacle wasn't really all that bad, though I did get confused with the various headlamps below and above going back and forth on the switchback trails leading to the top. There were inspirational messages (read: aid station menu) and promises of a party posted along the trail and when we finally made it, I did indulge in a bacon, egg and cheese tortilla sandwich. We filled up our bottles (e.g. Jeff filled up my bottles) and I was ready to keep going again. I have to admit, this next section was the toughest for me both physically and mentally. I did recall Todd talking about another serious climb right after the Pinnacle aid station, but this felt much more serious than just another climb. I mean, come on, WTF! I though the next climb was Horn mountain. Is this Horn mountain? No? Well, WTF! At first I cursed a little out loud, then I just cursed inside my head and got quiet for a while. This was my second "low" point during the race. Jeff checked with me to make sure I was okay. He made sure I kept on top of my nutrition, because I had started to get confused about when I had had my last gel or SCaps. I was ready for some downhill running, but any downhills we encountered were technical and dark single track trails. The uphills weren't much better, rutted out jeep roads that did not make for easy climbing, at least not at this point in my race. 15 miles of downhill and I would be at the finish. If I could run this in three hours, I would break 22 hours and I was determined to do just that. After all, it was all downhill from here, right? Wrong! Yes, it started out with a smooth jeep road, but it went up, then down a little, then up again. Seriously? It went on like this and I had to bite my tongue a time or two as I didn't want to make Cary's sensitive ears hurt. Well, I wasn't successful at that for long. It just kept rolling, I though we are supposed to come off this mountain and head into town. What is this? Poor Cary had to listen to a few choice words before I got over it. 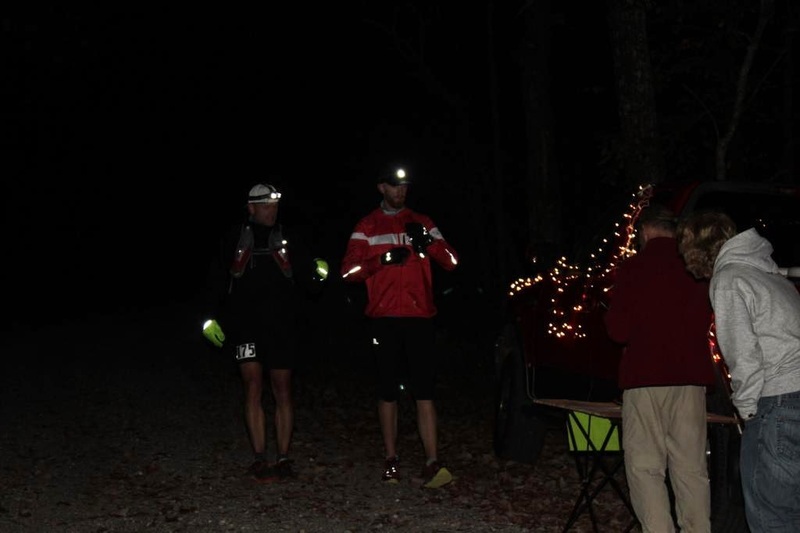 I was getting that sub 22 hour finish, so we kept moving, Cary showing the path with his headlamp, me putting one foot in front of the other. I had a few "quick" miles and a few not so quick miles, but we kept chugging along. My wife Anya and Cary had talked and decided that it would be best for her to meet us somewhat near the finish. We weren't sure of the terrain and how well I might be moving at that point, so she would basically start running towards us from the finish line, so I could run the last mile or so with her to the finish. This plan worked out perfectly. We were moving as well as can be expected at this point of the race and when Cary and I finally got dumped out onto the 2.2 mile stretch of road leading to the HS stadium and the finish line, I was excited. We kept running and after about a mile or so, I spotted Anya running in the opposite direction to meet us. A fog had moved in (or what that just my foggy mind) and everything around us aside from the street lights was dark. I kept my eyes on the asphalt looking for the next arrow, but Anya knew the way. I have to admit, this was the longest 2.2 miles of road I had ever run, but Cary and Anya coaxed me along. When we finally arrived at the stadium, I had to figure out how to actually get to the track, but Anya knew where to go and we finally stepped on to the track for a final 200m "dash" to the finish line. 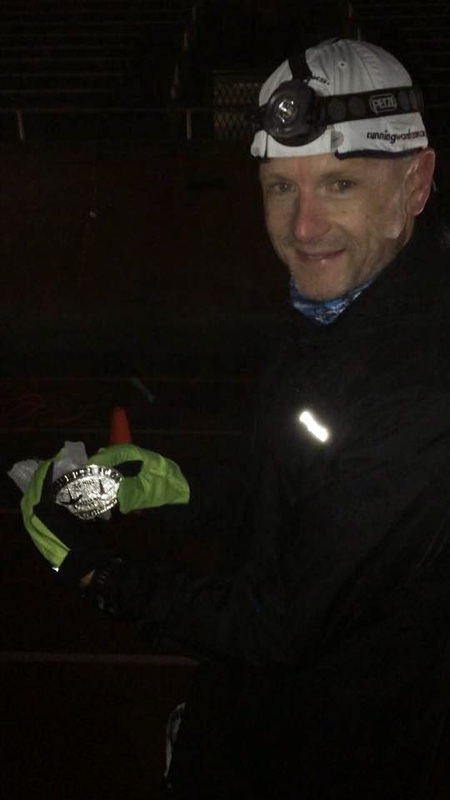 I crossed the finish line in almost complete darkness (see finish line pic below), but Todd appeared on cue to hand me my first Pinhoti 100 buckle after 21 hours and 36 minutes. I was absolutely elated. We headed into the finish line tent, where I got to talk to some of the other finishers while eagerly awaiting a plate of fresh pancakes made by Todd's awesome wife Jamie. Showing off my most prized new bling at the finish line! After hanging out for a while, we decided it would be best to take a quick shower at the hotel and try to get a couple of hours of rest along with some more food from the Huddle House next to the hotel. Suffice it to say, I didn't get much sleep, but Cary had no problem passing out, curled up next to the heater in our hotel room. I just kept staring at my shiny new buckle. Once I finished the race, I also received another cool gift. 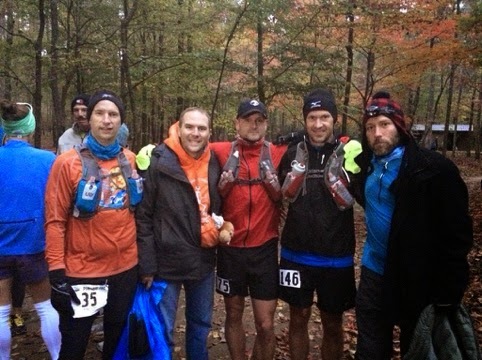 James Duncan, my training buddy and Jerry Abbott's crew chief, had put a monkey in a Pinhoti 100 shirt (see pic below) and had this guy unbeknownst to me photobomb me at every other aid station as well as hang around me all day. This was the proverbial Pinhoti monkey that I had been trying to get off my back ever since I attempted this race for the first time in 2010 and for the second time in 2012. 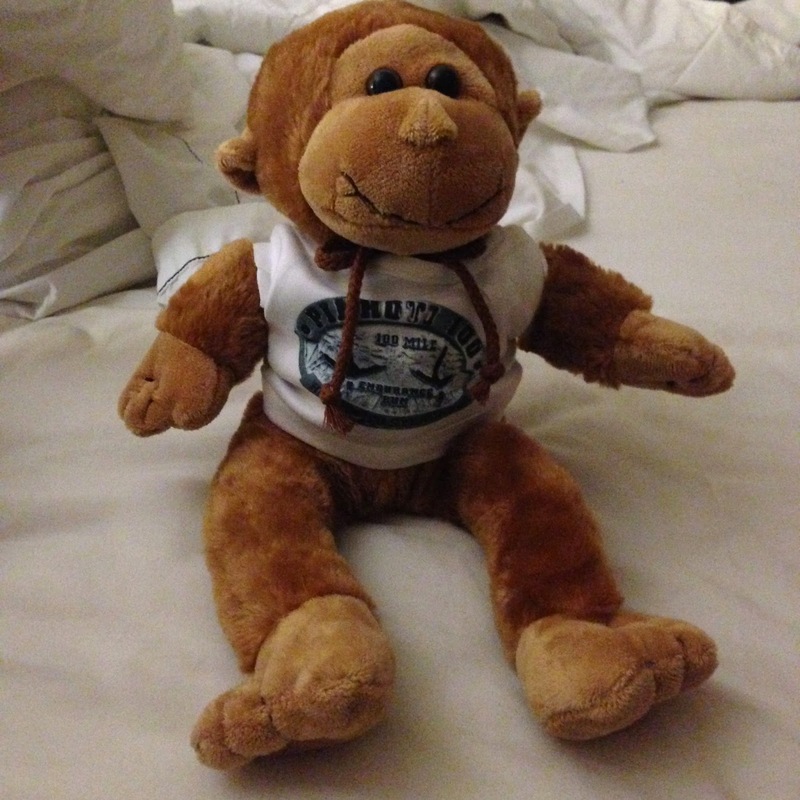 Now I have my own mascot for future ultra races to remind me of the road that got me here. Thanks again James, this guy is awesome! I have my own ultra mascot now thanks to James Duncan. I was finally was able to get this little guy off my back. Finally, I need to thank my amazing wife for putting up with my running habit and the need to train for a 100 mile race, which can be quite time consuming and selfish at times. I also need to thank my entire crew of Cary Long, Scott Bell, Jeff Deaton for allowing me to have a near perfect race. Thanks also to James Duncan, Benj Lance and all the other folks that helped me that day, be it by talking to me, cheering me on or handing me that delicious piece of bacon. The ultimate thanks goes out to Todd and Jamie Henderson and their absolutely amazing team of volunteers. Without these folks, none of us would have the opportunity to run this race or experience these trails. 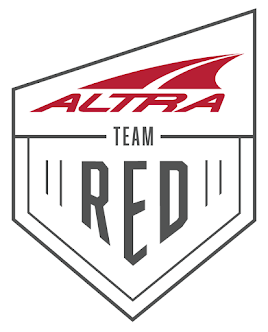 And thanks to a free race entry, I will be toeing the starting line again next year...and I can not wait! A daylight finish line picture after a shower, food and a short nap. You can never be over-prepared for a 100 miler. The Pinhoti 100 elevation profile is nothing to sneeze at. Great report, Martin. This was much more than just a race for you -- it definitely had a deeper meaning. Congratulations on your medical comeback and getting the monkey off your back. I really enjoyed reading your race report. I was out there pacing a friend who finished about an hour after you did. I may bump into you next year as a registered runner and my first 100 miler. Your blog was inspiring.